Prevalin For Kids is a nasal spray which contains a combination of oils and amulsifiers to help relieve symptoms of allerfgic rhinitis. 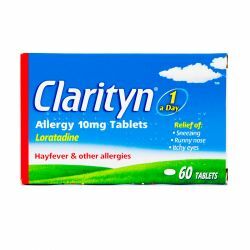 It works by creating a barrier in the nose, blocking the allergens which cause the allergic reactions. 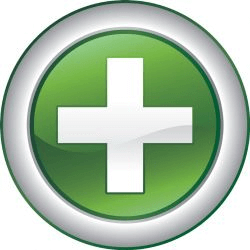 Prevalin is a drug and preservative free solution. All of its ingredients are inert and non-toxic, containing no preservatives, alcohol or scented chemicals. 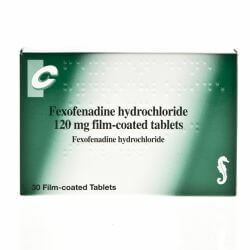 Prevalin does not cause drowsiness and is suitable for use in children aged between 6 and 12 years old. Prevalin For Kids should be kept out of reach and sight of children and should not be stored above 27 degrees celcius. Once opened. the bottle should be discarded after 3 months. The recommended instructions for using Prevalin For Kids is one to two sprays in each nostril two to three times a day. You should blow your nose thoroughly before each application. Shake well before using the spray. Only use the spray in the nose and do not swallow the spray. It is better to use Prevalin For Kids before coming into contact with allergens, as it prevents them from reaching the nasal lining and limits the allergy symptoms. 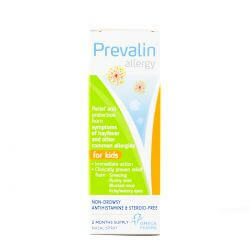 As this isn't always possible, Prevalin can be used as soon as you feel your body reacting to the allergens. The ingredients in Prevalin For Kids are as follows: bentonite, xanthan gum, glycerol stearate, potassium phosphate, dipotassium phosphate, glycerin, sesamum indicum seed oil, flavour and aqus. Prevalin For Kids should not be used if you are allergic to any of the ingredients in the medicine. You should talk to your doctor or pharmacist before using Prevalin if you have an infection in your nose or sinuses. Although Prevalin isn't known to interact with any other medicines, you should make sure to mention if you are taking any other medicines, including medicines obtained without a prescription. As with all medicines, Prevalin can cause side effects, although not eveyone gets them. You should stop using Prevalin and speak to your doctor if you have an allergic reaction to the spray, During the first hour of use, you may experience a slight blocked nose sensation. This should subside quickly and will gradually disappear with subsequent use.